You probably expect to see Santa Claus this time of year, but the Easter Bunny? You might end up seeing him too. Rise of the Guardians isn’t an adoption movie, but it still provides opportunities for discussions about dreams, fears, and identity. Children are protected by four Guardians: North (Santa), Sandy (the Sandman), the Easter Bunny, and the Tooth Fairy. They bring hope and joy to kids, and the children sustain the Guardians’ existence by believing in them. Other legendary creatures exist, but are invisible to children. Their lives are less meaningful because of the children’s unbelief. Jack Frost squanders away his time by making mischief, but also wonders why he isn’t known and loved. The Boogieman has become bitter and intends to use fear to force children into believing in him. Jack is called to join the Guardians to help defend against the Boogieman. Jack is reluctant because he views himself as a troublemaker. When he learns that he is a caretaker at heart, he gladly joins them. The Boogieman’s fearful plan does not work out, and he retreats. The children of the world continue having hope in their Guardians, including their newest hero, Jack Frost. Jack finds joy in helping others, but he does not initially realize this. He takes even more joy in learning the truth about himself: that he does take care of others. 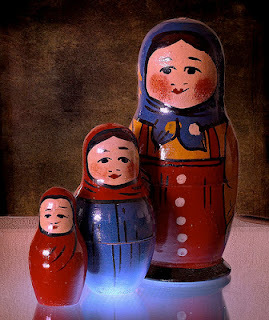 North uses nesting dolls to illustrate a valuable point: people are more than they appear to be on the surface. Each person has many layers, and deep inside they have a core value or trait which defines their lives. The movie suggests that children can overcome their fears and nightmares solely through hope and bravery. Children are able to defeat the Boogieman by facing and acknowledging frightening circumstances, and choosing not to be afraid of them. While bravery is certainly a helpful virtue, many children who have experienced trauma cannot simply “choose” not to be afraid. It wouldn’t even be particularly adaptive. 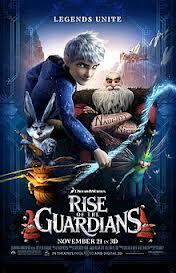 Therapy didn’t fit into the storyline of Rise of the Guardians, but it is an important step for some kids. This movie has the potential to be quite frightening to some viewers. Jack has a flashback of falling through the ice on a frozen lake. Some cute bird-like characters are imprisoned, and one is threatened with being crushed. The main villain sends nightmares into the world in an attempt to stop children from having hope. It’s quite striking, visually, and could be scary to some children. The nightmares take the form of dark, fiery horses reminiscent of those ridden by Peter Jackson’s Ringwraiths. The scene when the villain gets his comeuppance is also quite frightening: his own nightmares chase him in the form of black horses, and drag him into an abyss. o The Boogie Man to give children bad dreams. There are also happy dreams in the movie. Are your dreams happy or sad? What are your favorite dreams? What are your least favorite dreams? o When you are scared, what helps you feel better? o North has a special doll that he uses to show what is most important about him. What is the most important thing about you? About your parents? About your siblings? o Who are your guardians? o The Guardians care about children and protect them, but do not know them well. One of them expresses, “We’re so busy bringing joy to children that we don’t have time… for children.” Perhaps this is an especially relevant point this time of year. Is the “busyness” of life keeping you from spending time with your kids? Is that “busyness” due to an overfull schedule or due to habitual busyness? If it’s a schedule thing, what one or two time commitments can you reduce? If it’s more habitual – why is it so important to feel busy? o In one scene, a little girl turns a nightmare into a pleasant experience by just being brave. When you were a child, were you able to simply work through your fears or did you seek comfort from adults? What do you observe your child doing for comfort when he or she is afraid? o Make a “Russian Doll” type of craft to express the layers of your identity. Try using two shoeboxes – a small one inside of a larger one. On the outside of the largest one, draw or write the interests and personality that people perceive about you. On the outside of the smaller box, write what you think your family perceives about your personality, your interests, and your thoughts. Is it different from how the outside world sees you? On the inside of the smaller box, write what you know or think about yourself. Who are you, really? Help your children to make a similar craft. Feel like watching something at home? You might like my adoption discussion guide of the Kung Fu Panda movies or my adoption discussion guide of Disney's Tarzan. If you do the craft activity, I'd love to see it! Please think about posting a link to it in the comments!